With an illustrious history, impeccable service, and an ideal location, it's easy to see why composer Igor Stravinsky and Nobel Prize-winning guests like Enrico Fermi and Mikhail Gorbachev chose this refined hideaway as their Florentine home-away-from-home. You needn't be a student of Romanesque and Gothic architecture to sense the significance of your surroundings at the elegant Hotel Helvetia & Bristol. 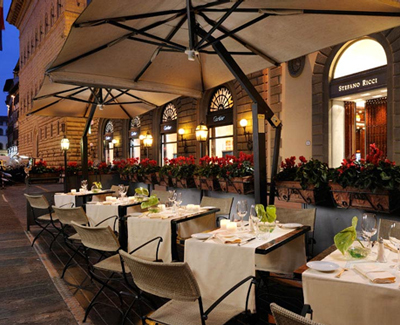 Located in the heart of the historic center of Florence, this prestigious hotel lies between the Piazza della Repubblica and Via Tornabuoni, and just around the corner from the celebrated Piazza del Duomo, with its famous red-domed cathedral. The luxurious former mansion still retains its residential feel, serving as your very own strategic home base for excursions to the exclusive boutiques and shops that line these famous streets. A complete who's-who of high fashion—Gucci, Pucci, Ferragamo, Cavalli—are mere steps away, as are the goldsmiths and antique shops for which Florence is known. Each of the 67 guest rooms and suites has its own Florentine character and old-world charm, all the while drawing you into its breathtaking city views from most every window. The antique furnishings, paintings, and Carrara marble baths blend tastefully with modern technology that includes flat-screen TVs and high-speed Internet—just enough to make you feel at home. And in case you want to stick close to home, the hotel's Hostaria Bibendum Restaurant & Bar creatively revisits genuine Tuscan cuisine with a special emphasis on local recipes and the freshest of ingredients. You'll enjoy the hands-on help from the friendly wait staff as they assist you in selecting the perfect wine to accompany your meal. You can even sign up for a cooking class with renowned Chef Enzo Petté, and learn all the secrets you need to bring the traditional flavors of Tuscany back home with you—making your stay at Hotel Helvetia & Bristol even more delicious!